Below: Going Incognito, a medium tone forest green jelly finish creme shade with the slightest hint of blue. 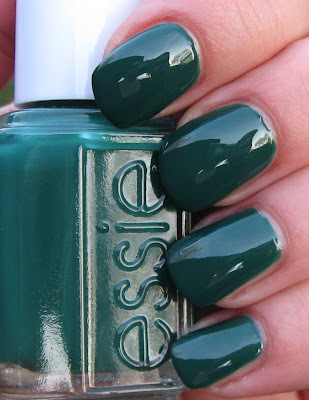 The closest shade I have to this is Orly's Enchanted Forest, but the Essie has just a touch of blue in it, which makes it different enough that if you love greens, you'll love this one! Below: Luxedo is also a jelly finish, something I can't ever have enough of! 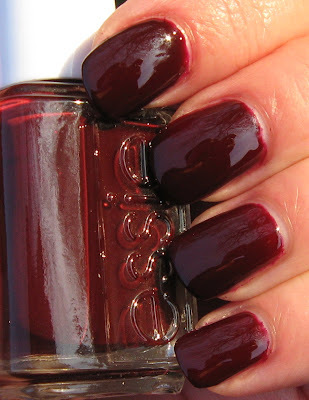 This is a deep eggplant shade that although very dark, doesn't look black on the nail. Below: Masquerade Belle is yes--another jelly finish! This vampy wine creme shade was the only one that caused me some problems during the application. The formula on this was a little thin and because I wasn't careful, I ended up with some pooling around the cuticle. Now that I know this, I'll use more caution the next time I use it. Below: If you're only going to choose one from this collection, Smokin' Hot is my pick. I'm at a loss to accurately describe this shade--is it a charcoal brown/grey with a hint of mauve? Or is it a mauve with a hint of charcoal brown/grey? As you can see in the photos taken in full sun and shade, I do believe it's both! Below: A pale mocha brown creme, Hot Coco is a familiar shade, but taupe shades are always welcome in my collection. Below: Silken Cord adds a pop of color to this collection, and it's definitely not as seasonal as the others. 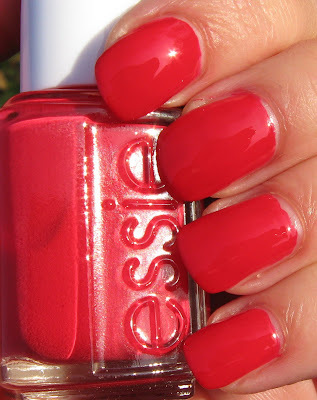 This perfect coral red shade will work well for you throughout the year. 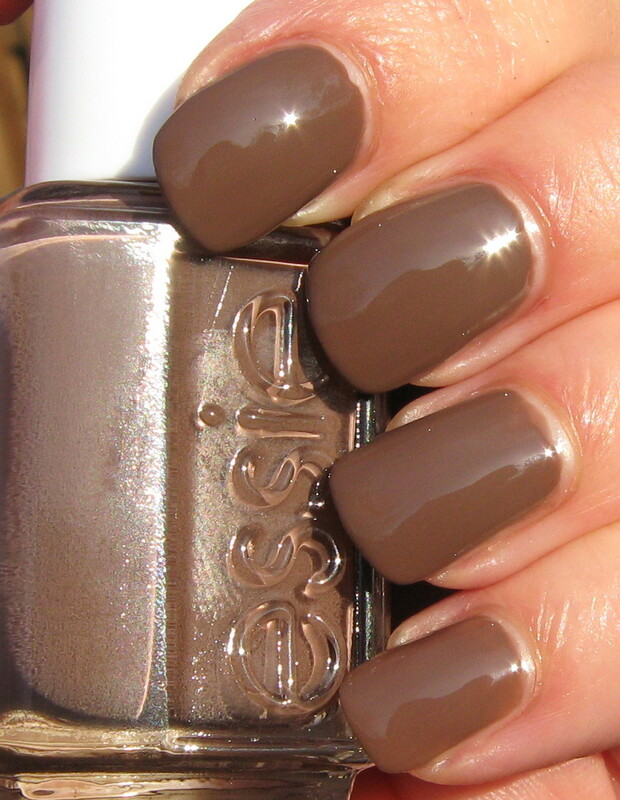 Essie has done a wonderful job with this collection--a range of fabulous creme shades, including 3 jelly finishes. These colors that work perfectly for the season and beyond. The application on all of them (note the slight problem I had with Masquerade Belle) was very good, and I used 2 coats in the photos. They're highly pigmented and very creamy, and if I had to award a prize for Best Application in A Polish, Silken Cord would walk away with that honor. Un. Believable. What do you think about this collection? Let us know if you're planning to pick any of these shades up! These look oh so sweet! Smokin' Hot and Going Incognito are the two that I really want. I'd be very happy with all of them if I win the contest! They all look gorgeous on you. Ok, it's official. I NEEEEED Smokin' Hot! I love this collection! I ordered a few the other day, but I will need to out and find Luxedo-that one is stunning! going incognito and masquerade belle are so pretty! These are SO beautiful. I love Silken Cord! Well done Essie. In addition to having a bit of blue, I think Going Incognito might be a bit lighter than Enchanted Forest...I don't have the Essie, though, so I'm not sure. I really, really like Smokin' Hot, but I think the whole collection is good. Lovely Addison~it's a great collection--a couple of dupe-y ones, but overall, very nice. peripatetic33~I don't have an Ulta :( I sometimes see $5.00 off coupons in some of my magazines, I'll send it to you the next time I see one! nihrida~that is a must have! Just different enough than my other greens. Lolaa~thanks for thinking of me, ha-ha! You just reminded me that I never swatched my Fall ones--yikes! Brenda~I agree! Perfect assortment of shades. 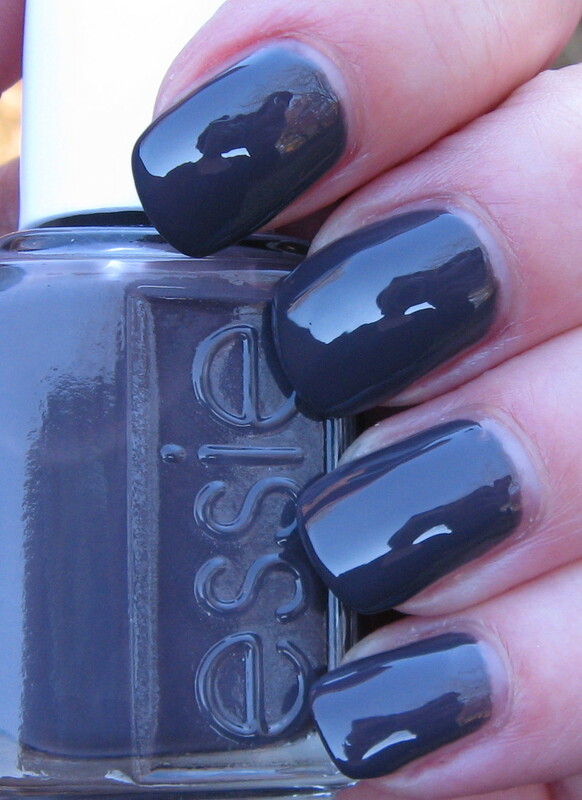 Polish'd Cindy~it's so dark, but you can still see some color, which I love! Very vampy. colorfulbottle~I like that one too, and it's so jelly/glossy. Very pretty. Malin~that one reminds me of something, but I've yet to figure out what! I do like it though, very much. Mia~of course I love Going Incognito, and Silken Cord, while similar to others I have, had such a perfect formula. my leetle nails~Masquerade Belle is gorgeous, I just need to be more careful when I apply it next time! Alyse K.~it's a very nice collection and I think you'll be very happy with any from this collection. Zara~you're right, it is a bit lighter in additionn to being a tiny bit more blue. Smokin' Hot is a nice one!